Fish and chips on the beach. Salt in your hair and sand in your knickers, there are few things better than devouring a hot parcel of fresh chippies and digging into a fat potato scallop. Add a cold beer and we are in absolute heaven. We’ve rounded up our fave places to flake out on the Sunshine Coast! Dive into classics like chicko rolls and dim sims or dig into exotic eggplant (oooh!) at Red Emperor. Take some fresh snapper home to cook up or grab the gang and get your mitts on a River Pack. Two pieces of fish, 12 calamari, 6 Tasmanian scallops, chips and sauce. Famous for its 90s prices (um hello – meal for two for $18? What a catch! ), Nambour Fish and Chips is a Nambour institution. Crumbed, battered or grilled – team your fish with some of their sweet potato scallops (dayum girl!) and a giant Greek salad, or go all out with loaded cheese and bacon fries. Hnnng. Panko crumb battered prawn cutlets, perfect calamari and grilled scallops – sweet dreams are made of these. Let the chefs school you on how to fry up their fresh seafood or swim on over to Off the Hook for their famous fried fish burger with lettuce, tomato and tartare for just $10. They also serve up killer chocolate fudge brownies and milkshakes. More than just chips and battered fish (although YUM), the Hamptons inspired Saltwater is the perfect spot to enjoy a glass of wine or cold beer overlooking the Mooloolah River. Slurp down freshly-shucked oysters and fill up on calamari – or keep it classic with hot, hand cut chips. Consider yourself a culinary wiz? Keen to fry up some fish? 98 Fish is your ticket to fresh seafood at home. From Mahi Mahi to Spanish Mackerel and everything in between, the Forest Glen local fave is one of our favourites. Do yourself a favour and load up on prawns too. 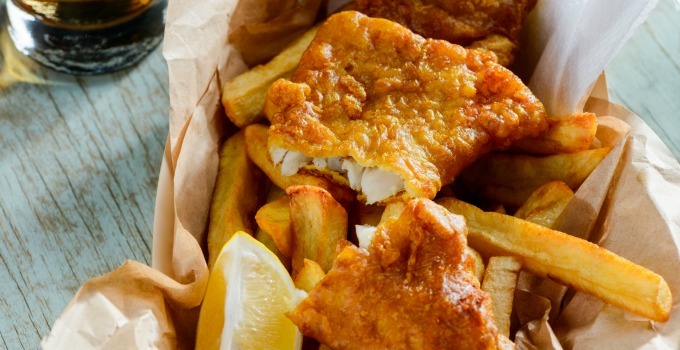 Frequented by locals and tourists alike, Fisheries on the Spit has been serving up A+ fish and chips since 1982. Bring your mates together and split a family pack on the Spit. Crumbed cod, potato scallops, pineapple fritters (!!!! ), calamari, chippies and a big ol’ bottle of soft drink. Heaven. Heading to Caloundra? Swing by De Lish Fish and order their signature pack – fish of the day, prawn cutlets, sea scallops, fish cakes, calamari, chips and tartare sauce. Either chill out the front or take your catch down to Kings Beach before you have a swim. Fish might be friends, we like them better as food.